Wednesday, Friday and Saturday of this week are the harvest Ember Days, a three-day period of prayer and fasting which recurs four times over the course of the year. 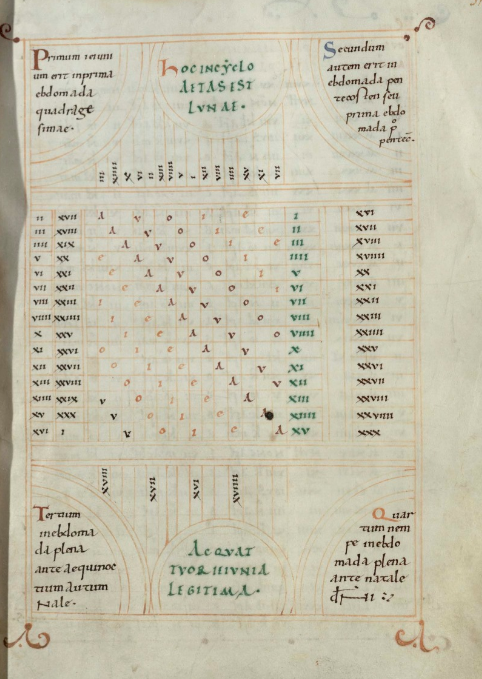 By ancient tradition there are four periods of Ember Days, corresponding with the four seasons: they fall in the weeks following the first Sunday in Lent, Whitsun, the Feast of the Exaltation of the Cross (September 14), and St Lucy's Day (December 13). The last two, being tied to fixed rather than moveable feasts, will always fall fairly close to the autumn equinox and the winter solstice, and so at the mid-point of these seasons (in traditional reckoning the solstices and equinoxes were usually understood to mark the middle or height of seasons rather than, as often today, the beginning). The origins of the Ember Days are usually explained as lying in pagan Roman custom, petitioning the gods for aid at different points in the agricultural cycle, from the seed-time to the harvest, in the height of summer and the depth of winter. By the fifth century, and perhaps before, they had been adopted for Christian use by the church in Rome, and as they gradually spread further afield they were widely observed by the medieval church. Though not much noticed today, they are a reminder of how closely linked the medieval church was to the natural world, intently attuned to its seasons and cycles, and always ready to see human life not as separate from nature or from God but as part of one organic whole, in which the natural, the human, and the divine are interrelated at the most essential level. 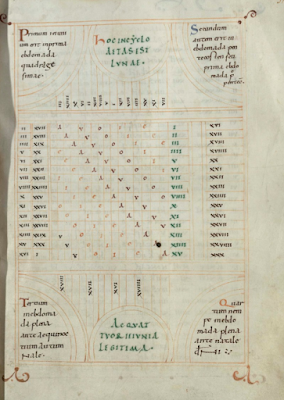 The Ember Days were observed in Anglo-Saxon England from at least the eighth century onwards; they are regularly prescribed in lawcodes and mentioned in standard learned works on computus (the calculation of time and church calendars - a very complicated science, which was an endless fascination to mathematically-minded early medieval scholars!). 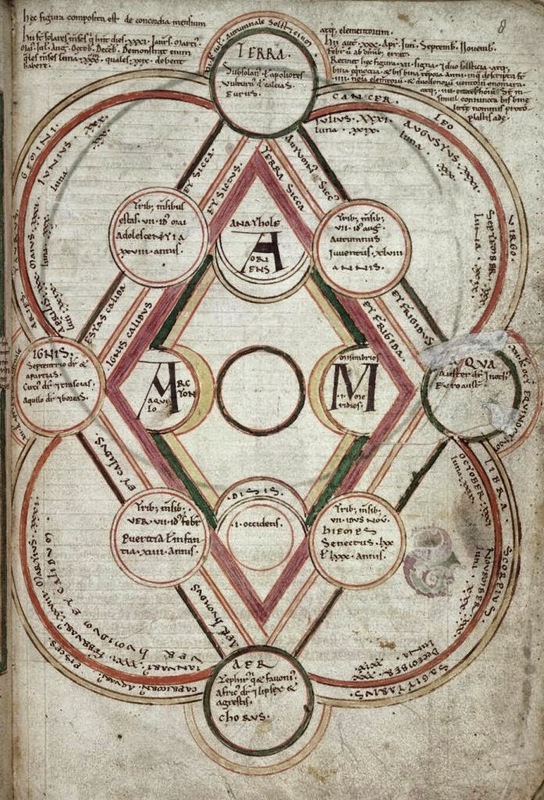 Most of the images in this post come from 11th and 12th-century English manuscripts which find different ways of representing the Ember Days in diagram form - divine science which is turned into art, too. 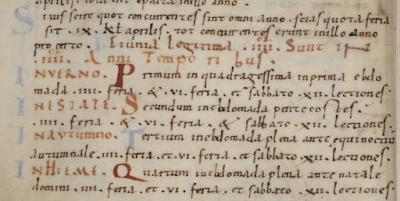 In Latin these days are called quatuor tempora, and tempora might perhaps be the origin of the Old English name, ymbren, from which we get 'Ember'. 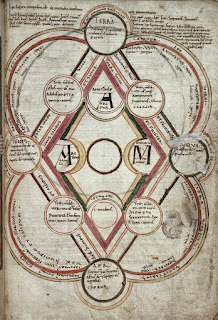 However, since ymb- is a very common Old English prefix, meaning 'around', a learned Anglo-Saxon might have perceived a (perhaps etymologically spurious, but nonetheless meaningful) connection between the word ymbrendæg and a large group of words relating to cycles and circles, such as ymbhweorfan 'to revolve, turn around', ymbhwyrft 'a ring, a circular course, an orbit', ymbhabban 'to surround, encircle', and so on. 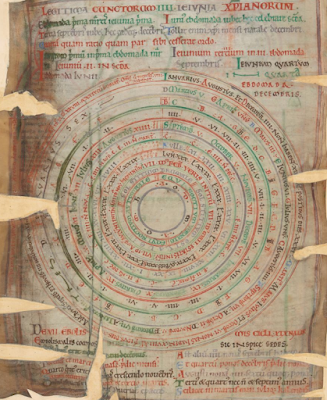 Other scholars in Anglo-Saxon England were less interested in the calculation of the Ember Days than in their history and their moral purpose. There was a firm belief, mentioned in several late Anglo-Saxon sources, that they had been introduced into England by St Augustine of Canterbury himself when he was sent by Pope Gregory to evangelise the Anglo-Saxons at the end of the sixth century. (It's possible this is true, though it would be hard to prove either way.) A homily attributed to Wulfstan gives a memorably rhyming encapsulation of this detail: 'Ymbrenfæstena healde man rihte, swa swa Scs. 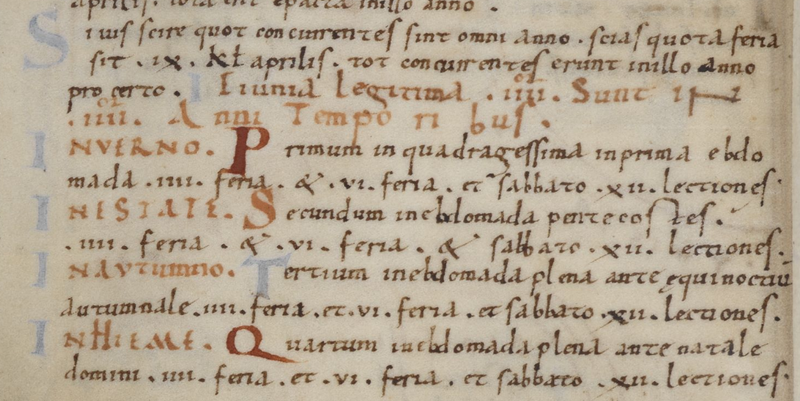 Gregorius Angelcynne sylf hit gedihte' (roughly: 'Ember-fasting keep we ought, / as St Gregory the English taught'). To Anglo-Saxon Christians of this period, educated in the tradition of Bede's narrative of the English church, there was no greater earthly authority than that of St Gregory and Augustine; they were the founders and fathers of English Christianity, and a custom linked with them must be supremely venerable. Gregory, Pope of the people. In the poem the discussion of the Ember Days and fasting in general is followed by a fervent denunciation of sinful priests, whose duty is to help the laity become closer to God, but who are themselves, it says, too often stained by sin: they 'daily offend the Lord by their neglect', misleading their people and caring more for drinking wine and eating oysters (!) than for their sacred duties. At this point the poem breaks off, before the poet can enumerate any further enormities of the contemporary clergy. The gluttony and self-indulgence for which the poem attacks priests are, of course, meant to be tamed by fasting and self-denial such as practised in the Ember Days. The fasting of the Quatretemps, called in English Ember days, the Pope Calixtus ordained them. And this fast is kept four times in the year, and for divers reasons. For the first time [first season, i.e. spring], which is in March, is hot and moist. The second, in summer, is hot and dry. The third, in harvest, is cold and dry. The fourth in winter is cold and moist. Then let us fast in March which is printemps [spring], for to repress the heat of the flesh boiling, and to quench luxury or to temper it. In summer we ought to fast to the end that we chastise the burning and ardour of avarice. In harvest for to repress the drought of pride, and in winter for to chastise the coldness of untruth and of malice. The second reason why we fast four times; for these fastings here begin in March in the first week of the Lent, to the end that vices wax dry in us, for they may not all be quenched; or because that we cast them away, and the boughs and herbs of virtues may grow in us. And in summer also, in the Whitsun week, for then cometh the Holy Ghost, and therefore we ought to be fervent and esprised in [inspired by] the love of the Holy Ghost. They be fasted also in September tofore Michaelmas, and these be the third fastings, because that in this time the fruits be gathered and we should render to God the fruits of good works. In December they be also, and they be the fourth fastings, and in this time the herbs die, and we ought to be mortified to the world. The third reason is for to ensue [follow] the Jews. For the Jews fasted four times in the year, that is to wit, tofore Easter, tofore Whitsunside, tofore the setting of the tabernacle in the temple in September, and tofore the dedication of the temple in December. The fourth reason is because the man is composed of four elements touching the body, and of three virtues or powers in his soul: that is to wit, the understanding, the will, and the mind. To this then that this fasting may attemper in us four times in the year, at each time we fast three days, to the end that the number of four may be reported to the body, and the number of three to the soul. These be the reasons of Master Beleth. The fifth reason, as saith John Damascenus: in March and in printemps the blood groweth and augmenteth, and in summer choler, in September melancholy, and in winter phlegm. Then we fast in March for to attemper and depress the blood of concupiscence disordinate, for sanguine [blood] of his nature is full of fleshly concupiscence. In summer we fast because that choler should be lessened and refrained, of which cometh wrath. And then is he full naturally of ire. In harvest we fast for to refrain melancholy. The melancholious man naturally is cold, covetous and heavy. In winter we fast for to daunt and to make feeble the phlegm of lightness and forgetting, for such is he that is phlegmatic. The sixth reason is for the printemps is likened to the air, the summer to fire, harvest to the earth, and the winter to water. Then we fast in March to the end that the air of pride be attempered to us. In summer the fire of concupiscence and of avarice. In September the earth of coldness and of the darkness of ignorance. In winter the water of lightness and inconstancy. The seventh reason is because that March is reported to infancy, summer to youth, September to steadfast age and virtuous, and winter to ancienty or old age. We fast then in March that we may be in the infancy of innocency. In summer for to be young by virtue and constancy. In harvest that we may be ripe by attemperance. In winter that we may be ancient and old by prudence and honest life, or at least that we may be satisfied to God of that which in these four seasons we have offended him. The eighth reason is of Master William of Auxerre. We fast, saith he, in these four times of the year to the end that we make amends for all that we have failed in all these four times, and they be done in three days each time, to the end that we satisfy in one day that which we have failed in a month; and that which is the fourth day, that is Wednesday, is the day in which our Lord was betrayed of Judas; and the Friday because our Lord was crucified; and the Saturday because he lay in the sepulchre, and the apostles were sore of heart and in great sorrow. This traces eight different ways in which the Ember Days can related to patterns of human and natural cycles, encompassing interpretations moral, allegorical, seasonal, historical, scientific, and medical. Such an assortment of post-hoc explanations for the practice, provided by various authorities and supported by reference to the science of the four humours, might today raise a smile, but it's really rather beautiful in its own way; rather than simply explaining the history of the Ember Days, as a modern preacher might, this seeks to explore deeper correspondences between the four seasons, and the fasts which mark them, and cycles of growth and death which affect everything in the natural world, including the human body. (I particularly like that in autumn 'we fast in order to control melancholy'; that feels about right!) The various explanations are meant to complement each other, and they reflect a view of the world as essentially ordered, in which the cycles of human health, or human emotion, or natural growth and decay, are all connected to divinely-arranged patterns which shape the universe.